According to Transparency Market Research’s new market research report, titled ‘Hydrazine Hydrate Market - Global Industry Analysis, Size, Share, Growth, Trends and Forecast 2014 - 2022’, hydrazine hydrate is an inorganic compound used in many end-use industries due to its favorable chemical properties. Hydrazine hydrate is typically colorless and has an odor similar to ammonia. It is commercially manufactured using three production processes: the Bayer-Ketazine process, the peroxide process, and the Olin-Raschig process. These production processes also use various raw materials such as sodium hypochlorite, ammonia, hydrogen peroxide, and acetone along with catalysts to form hydrazine hydrate. The study report states that the global hydrazine hydrate market stood at US$350.0 million in 2013 and is further expected to reach US536.3 million by 2022. Owing to its use in a number of industrial applications, the global market for hydrazine hydrate is expected to expand at a CAGR of 4.9% from 2014 to 2022. The report covers the impact of the various market drivers and restraints acting on the hydrazine hydrate market during the forecast period and highlights the growth opportunities in the hydrazine hydrate market globally and regionally. 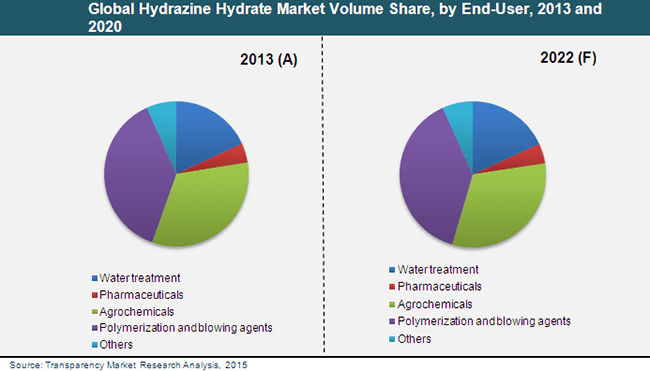 It also provides a decisive view of the global hydrazine hydrate market by segmenting it in terms of end user segments. The segmentation in the report has been analyzed based on present and future trends. By end use, the report enlists water treatment, agrochemicals, pharmaceuticals, polymerization and blowing agents, and others (including metal purification, etc) as some of the major end-use segments of the hydrazine hydrate market. As hydrazine hydrate is one of the main blowing agents used in the polymer industry, a strong outlook for polymer foams in the polymer industry is expected to drive the hydrazine hydrate market with significant growth. Polymerization and blowing agents was the largest end-use segment, with a market share of more than 35% in 2013. This segment is expected to be the fastest growing segment of the hydrazine hydrate market until 2022. Besides its usage in the polymer industry, hydrazine hydrate is also used in many other industries such as water treatment and agrochemicals. The global agrochemical industry revenue is expected to grow at a rapid pace between 2013 and 2022. Rise in the production of intermediates used in insecticides and fungicides is anticipated to boost the demand for hydrazine hydrate from the agrochemical industry in the near future. Hydrazine hydrate is toxic to humans and its usage is thus limited to a certain extent. However, its use in fuel cells as an effective substitute of polymers can bring about a resurgence of the overall market in major regions such as North America, Europe, and Asia Pacific. By geography, the global hydrazine hydrate market is segmented into North America, Europe, Asia Pacific, Latin America, and the Middle East and Africa. Among these regions, the highest demand for hydrazine hydrate from the polymer industry as a blowing agent is expected to be observed in Asia Pacific in the next few years. In 2013, Asia Pacific was the largest regional market for hydrazine hydrate, accounting for over 55% of the market. Furthermore, it is now expected to maintain its leading position in the global market for the next eight years. With China-based manufacturers expanding their existing production facilities to meet the local demand for hydrazine hydrate, the hydrazine hydrate market in Asia Pacific is anticipated to rise rapidly in the next few years.